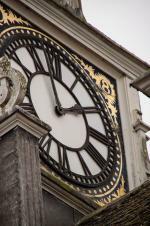 The clock as we see it today was added to the Town Hall during the 1883 Victorian Extension and building work. The whole clock tower had to be moved to ensure it remained at the centre of the building when they extended by one bay to incorporate a stairwell and new entrance hall. They used a very modern clock system called a flat bed system which was state of the art at the time. The flues and pulley system still exist from that clock. Although the faces remain the same, the system is now an electronic one. The clock chimes every hour. The clock is serviced and maintained by Smith Of Derby who look after lots of important clocks including the clock at St Paul's Cathedral in London.